The Courthouse in the Isle of Man's financial district has long since ruled the local nightlife scene with its popular bar, well respected restaurant and nightclub. 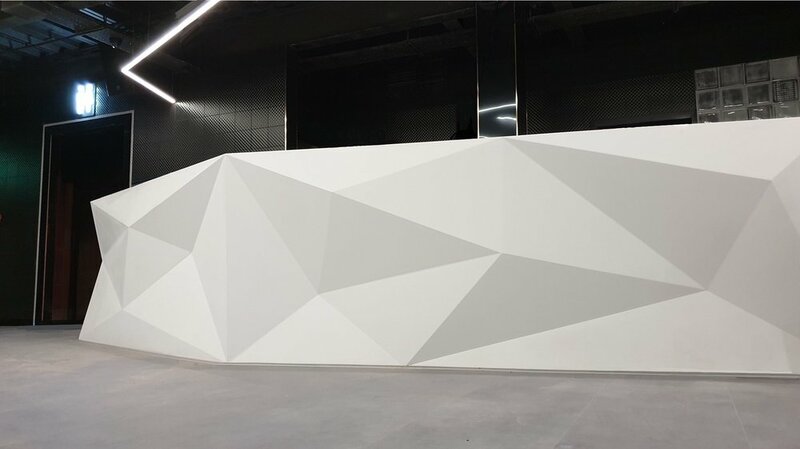 When Rehab2 was invited to come up with a new design concept for for the club, the challenge was more than embraced. It was a unique opportunity for designer, Gemma, whose early career centred around clubs when she worked as Operations Manager for the Virgin Group, heading up ‘Pure’ in Manchester and ‘Heaven’ in London before setting up a new club in Ibiza. For this refit, Gemma brought this experience together with a genuine love for clubbing, resulting in her most authentic interior to date. 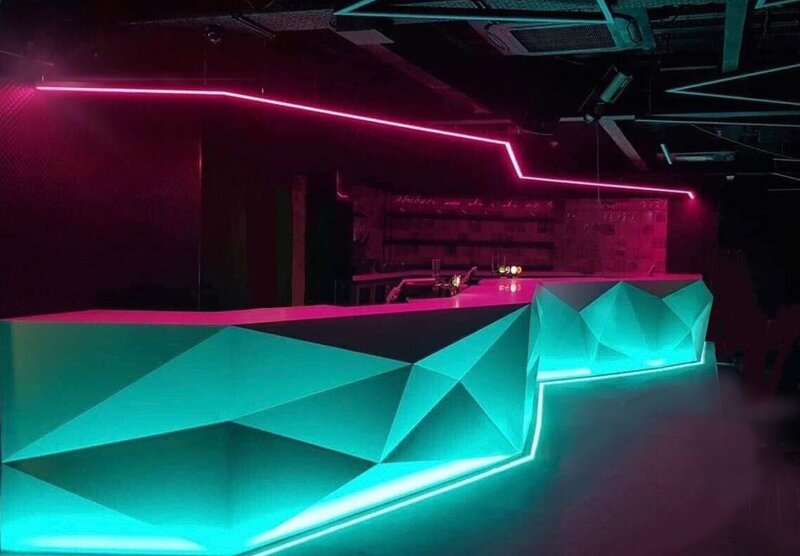 Borrowing aesthetics from classic clubbing culture, combined with futuristic elements, the result is a space-age entertainment space, an explosion of light with a respectful nod to the retro style of the eighties - an uncompromising colour-popped visual feast. Sensory and sonic immersion. A huge solid monolithic, glacial white bar dominates the space. The entire front facade is a complex geometrical feat of architectural engineering. At over 7 metres long, it is an awesome spectacle. Semi-private seating ‘pods’ line the east wall of the space. To enhance the expression of the linear design style, cool white recessed profile LED lights that highlight the asymmetric lines of the ‘pod’ structures, glow, flash and pulsate around the room to match the BPM of the music. The exterior wall of the booths are clad in highly durable PVC black gloss plastic, the ever-changing reflection of the lights bouncing off its surface. Slicing right through the baseline monochrome black and white colour palette is a riot of vibrant pop colour. 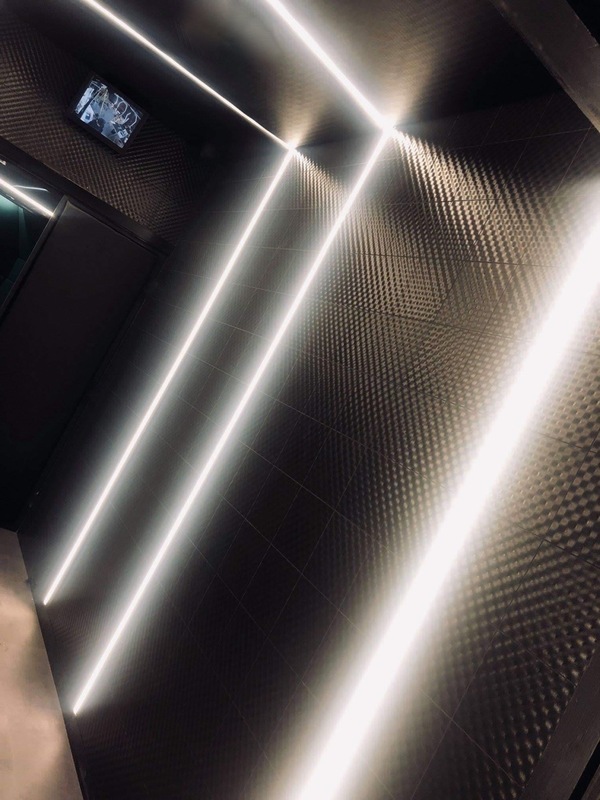 Contemporary black 3D knurled wall tiles are illuminated with cool white neon lights. Black matte steel mesh speaker grills and shelving reminiscent of roadie flight-cases and vintage musical instruments create a highly visual and tactile solid metal effect. Hard surfaces are juxtaposed with soft faux-leather upholstery. The floor areas marrying one side of the space with the other feature raw concrete floor tiles. From the state-of-the-art pioneering lighting installations, to the extraordinary feature bar frontage, to the bold and beautiful booths, the vision is brave and uncompromising. All or nothing. Go hard or go home. Entire concept created by Rehab Squared for the client.